Ariad's cancer drug Iclusig has received US approval for use in the treatment of two forms of leukaemia more than three months ahead of schedule. The Food and Drug Administration (FDA) said the drug should be available for patients with chronic myeloid leukaemia (CML) and Philadelphia chromosome positive acute lymphoblastic leukaemia (Ph+ ALL) following an accelerated review process designed for investigational products in areas of unmet medical need. 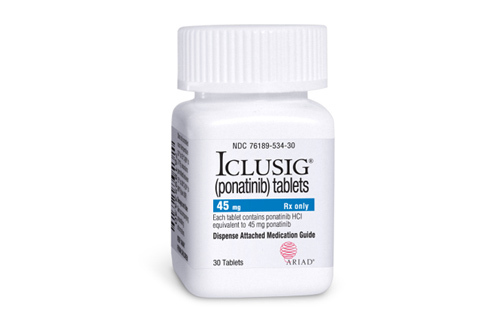 The agency said the approval of Iclusig (ponatinib), which had a goal date of March 27, 2013, was especially important for patients with a cell mutation known as T3151. This mutation can cause patient resistance to currently available tyrosine kinase inhibitors (TKIs), but Iclusig is a TKI developed to target cells that have this mutation, adding a valuable new treatment option for this group of patients. As part of the accelerated approval process, Ariad will have to conduct additional studies to confirm the drug's clinical benefit and safe use before full approval is granted. In addition, Ariad also announced its Ariad PASS (patient access and support services) programme to help patients who are eligible for the drug. It will be available for both uninsured and insured patients in the US, and offers benefits verification and financial assistance to help with the medicine's cost and adherence. The programme also includes Ariad PASS nurses who provide treatment support for patients taking Iclusig. Dr Harvey Berger, chair and CEO of Ariad, commented on what the approval means for the company. “Within less than five years, we were able to bring Iclusig from the start of clinical development to US approval, achieving a major milestone in ARIAD's history,” he said. However, even with its ability to target T3151, Ariad still has some catching up to do on leukaemia drugs that have already been approved in the US this year. Pfizer's Bosulif (bosutinib) and Teva's Synribo (omacetaxine mepesuccinate) were approved to treat various phases of CML in September and October respectively, while Talon's Marqibo (vincristine sulfate liposome injection) was approved in August 2012 to treat (Ph+ ALL).